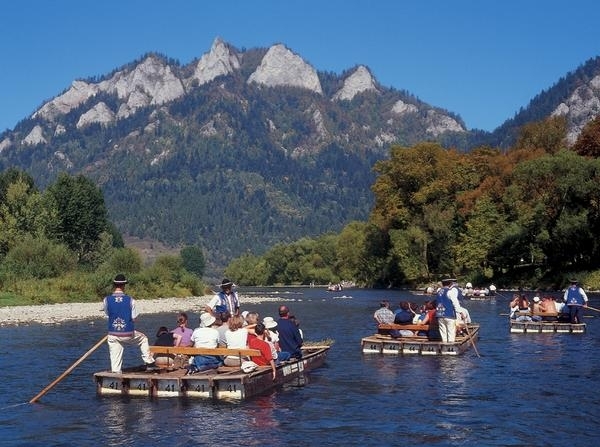 This is the greatest attraction of Pieniny Mountain and there are over 100.000 tourists participated in rafitng each year. A sailing trip down the mountain river on a wooden raft through the limestone rocks of Pieniny Mountains has got to be the most beautiful river trip in Poland. You admire the beautiful landscapes of the Pieniny National Park and listen to the funny stories told by navigating raftsmen. Trip starts in Sromowce and ends in Szczawnica – total route’s length: 18 km, duration of the rafting route: 2 hours 15 min. The tour also includes the short visit to the Renaissance defensive castle of Niedzica (13thc c./14th c.) to admire a splendid panoramic view over the Czorsztyn lake and the ruins of 14th c. Czorsztyn castle. On the end a visit to the 15th c. wooden Gothic country church in Debno before return.